Deuterium-labeled compounds are widely utilized in various scientific fields. 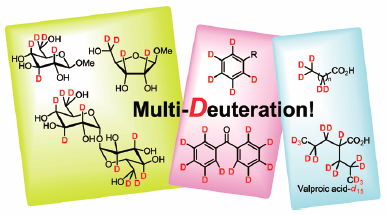 We summarize the recent advances in the direct deuteration of sugar, saturated fatty acid, and arene derivatives using heterogeneous platinum group metal on carbon catalysts by our research group. Hydrogen gas is a key catalyst-activator to facilitate the present H–D exchange reactions. In this review, the direct activation method of catalysts using in situ-generated hydrogen based on the dehydrogenation of alcohols is introduced. The obtained multiple deuterium-labeled products, including bioactive compounds, are expected to contribute to the development of many scientific investigations.